By proclaiming September 2018 as Ovarian Cancer Awareness Month, we call attention to a disease that affects women across our county, state, and country, with the American Cancer Society estimating that 14,070 American women are projected to lose their lives to Ovarian Cancer this year. These women are mothers, daughters, sisters, grandmothers, community members, and cherished friends, and the absence they leave in our hearts will be deeply felt forever. Ovarian Cancer knows no boundaries, the disease can strike anyone, across lines of age, ethnicity, and race. Because Ovarian Cancer often goes undetected until advanced stages, increasing the awareness of risk factors is critical to fighting this disease as it is estimated that about 22,240 new cases of Ovarian Cancer will be diagnosed in the United States this year. The public awareness campaign strives to increase knowledge about this disease and recognizes the best defense against Ovarian Cancer is early detection, therefore it is essential that women know the risk factors associated with the disease, and that men are educated so they can help their wives, mothers, grandmothers, aunts, sisters, and girlfriends. This month is dedicated to prevention and awareness, it is also to honor those we have lost, show our support for women who bravely carry on the fight, and take action to lessen the tragic toll Ovarian Cancer takes on families across our county. 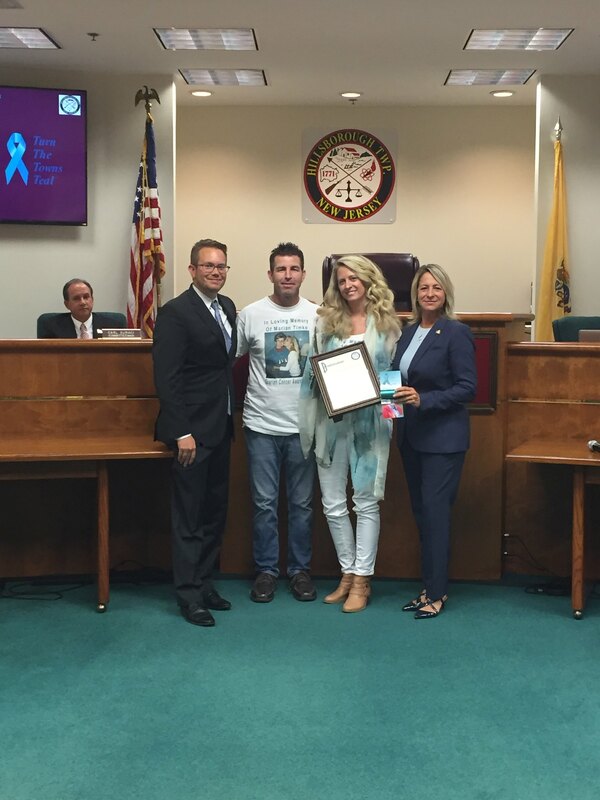 The Hillsborough Township Committee recognizes September 2018, as Ovarian Cancer Awareness Month, and calls upon citizens, government agencies, organizations, health care providers, and research institutions to raise Ovarian Cancer awareness and continue helping women live longer, healthier lives and urge women to talk to their healthcare providers to learn more about this disease.